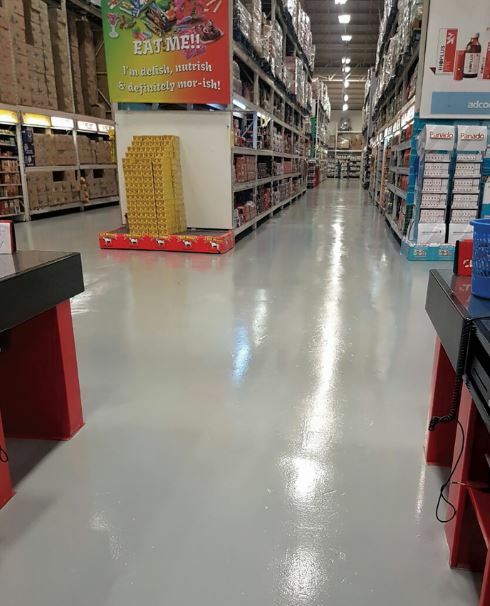 When Built Mart, a busy hardware store that forms part of the Kit Kat Group recently renovated its shop floors, they didn’t hesitate to contact Sika’s representative, Raj Naidoo, with whom they had been working for over ten years. The challenging project site, which is located in Pretoria West required repair and coatings of many imperfections on the floor. Sikadur-43 ZA (20 kits) and Sikafloor Garage (Telegrey, 450x5l) were specified for the project. Sikadur-43 ZA is a three-component repair and filling mortar based on a combination of epoxy resins and selected high strength aggregates, while Sikafloor Garage is a two-part, water-dispersed, epoxy resin-based coating suitable for concrete, cement screeds, broadcast systems and epoxy mortars. The contractors, Mazoyo Group, applied the products at night in sections in order to ensure that normal trading hours weren’t interrupted. After the products were applied, the sections were subsequently blocked off to prevent damage from foot traffic the following day. Another challenge was applying products around immovable shelving units in the hardware store. Two coats of Sikafloor Garage were applied to the floors after repairs were done with the filling mortar. This environmentally friendly product conforms to various international standards and is designed for normal to medium-heaving loading. It is odourless, easy to apply, water soluble and offers good chemical and mechanical resistance. A follow-up inspection of the floors at Build Mart demonstrated a highly successful project and left the client so impressed with the quality of the product that they have ordered another 5 000m2 project for Build Mart’s downstairs floor. For more information, contact Sika on +27 (31) 792 6500 or via www.sika.co.za.